Charles Sturt University (CSU) Bachelor of Animal Science (Honours) student Ms Jessica Hardie knew she’d been bitten by the ‘research bug’ when after a busy morning weighing cattle she couldn’t wait to analyse the results. Supported by a scholarship from the Graham Centre for Agricultural Innovation Ms Hardie’s Honours research is examining the use of canola meal as a feed supplement for beef steers. 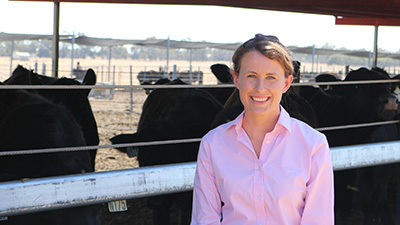 Over a month Ms Hardie conducted her research trial at the CSU cattle feedlot where 160 Angus-cross steers were fed on a ration of poor quality silage. “Half the steers received a supplement of canola meal, a by-product of oil production, while the other half received a supplement of wheat and cottonseed,” Ms Hardie said. “The cattle were fed everyday and weighed once a week. It was a hectic 28 days but I enjoyed the practical side of the research and couldn’t wait to crunch the numbers after weighing each week to see how the animals were performing. Ms Hardie hopes her research will provide useful information to beef producers. “There’s growing demand for grass-fed beef but that can create challenges for producers when pasture growth is insufficient, for example in dry seasonal conditions,” Ms Hardie said. “Supplementary feeding fills the gap and my research compared the live animal performance and economic potential of feeding a supplement of canola meal, a by product of oil production, with a supplement of cottonseed and wheat. Ms Hardie’s research was supervised by Dr Michael Campbell from CSU’s School of Animal and Veterinary Sciences. The Graham Centre’s Honours Scholarships aim to support CSU students undertaking a research project as part of an Honours year. The project must be closely aligned with our research to improve the sustainability, profitability and productivity of the grain and red meat industries. Apply by Thursday 15 November.